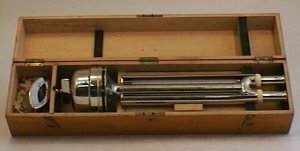 Chromed outer casing enclosing clockwork fan and two thermometers. 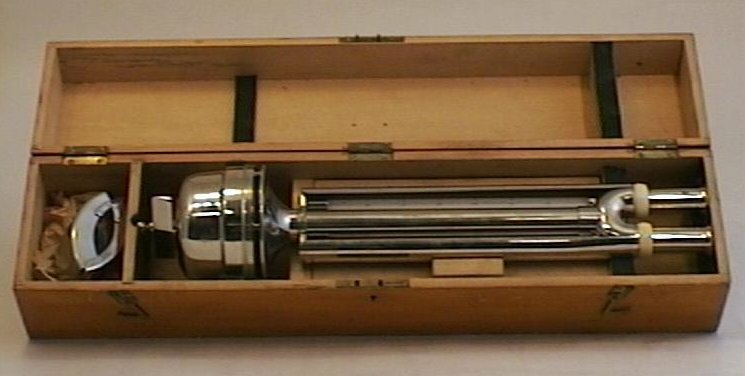 Thermometer bulbs extend into metal ventilation tubes at the base of the instrument. Air is drawn through the tubes, and up to connected shaft running between the thermometers, by a clockwork fan. Used in the measurement of humidity, and works on the principle of cooling due to evaporation. The bulb of one thermometer is encased by a wick which extends to the end of the corresponding ventilation tube. The wick is moistened and the fan causes an air current of 2-3 ms-1 past both bulbs. The difference in wet and dry bulb temperatures is utilised in calculations of the vapour pressure of water in the surrounding air. The instrument is designed to be portable, and comes with mounting bracket and hose clamps for the ventilation tubes.